BEIJING, China – At the end of his two-month long study and lecture tour in mainland China, Taiwan and Hong Kong, the Carnegie-Tsinghua Center for Global Policy has invited Prof. Patrick Mendis to speak about President Xi Jinping’s idea of the “Chinese dream” and emerging US-China relations. Prof. Patrick Mendis at the Carnegie-Tsinghua Center for Global Policy at Tsinghua University after speaking at the China Academy of Social Sciences and the China Foreign Affairs University in Beijing. Tracing back to the earliest years of Sino-American trade relations, Prof. Mendis remarked that “it is opportune time for China to revive its glorious past,” referring to the Chinese dream and rejuvenation. China’s unparalleled economic rise, highly civilised culture, and far-reaching Confucian morality have not only been making contribution and influence around the world, but also have left an inspiring heritage for others to emulate. In the cover article of the latest issue of Harvard International Review, Prof. Mendis further elaborated that the “Birth of a Pacific World Order” is being created by evolving Sino-American policies of Presidents Barack Obama and Xi Jinping. In a lecture at the China Foreign Affairs University in Beijing, he explained that Confucian values highlighted in the four pillars of authority, order, harmony and perfection have been nurturing China’s “invisible pyramid,” which has been conveniently used by leaders to advance their political goals within the current CPC power structure. The ultimate goal of “perfection” also serves as the substitute for “reform” in CPC’s official language. This ancient ideology has not only been embedded into the DNA of Chinese people, but also seemingly echoed with the vision of American Founding Fathers who inscribed “to form a more Perfect Union” in their Preamble to the US Constitution. This revealing coincidence was never a contrived effort, but a reflection of human nature, Prof. Mendis emphasised. If the period of almost 100 years of Sino-American “love affair” and the celebrated voyage of Empress of China were a guide, Prof. Mendis said he was optimistic of a more peaceful relationship between the two economic powers in the years ahead. In another Beijing lecture at the China Academy of Social Sciences, Prof. Mendis reminded that the Sino-American trade relations have had mutually benefitted the both nations from the mid-18th century until the first Opium War of the British in the 1840s. Just as the original 13 American colonies united by trade and “dream” – not by religion, language, ethnicity, or political persuasion – the past and current Sino-American relations have been flourished by trade and shared dream of prosperity and peace. 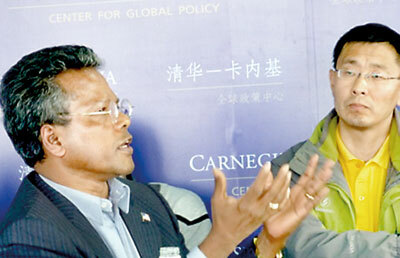 Mendis also hopes that the history will repeat once again in a “trade-for-peace” era if Washington and Beijing would manage this vital relationship for mutual advancement. The rejuvenation of historic trade-based “love affair” would turn out to be a “Pacific dream” in the new Pacific century, according to the former US diplomat and military professor, who was born in Sri Lanka but educated in the British and American systems.